Climate change issues will be more and more significant in the next years in South Africa and in the rest of the world. As a matter of fact, the best way to reduce it is to make our lifestyle more sustainable. This is exactly the goal of Project 90×2030, a non-profit organization which wants to inspire and bring about positive change in the way we engage with earth systems. Lorna Fuller, director of this NPO, explains us how the three main programs implemented by Project 90×2030 are a way to achieve this objective. Lorna Fuller, Director of Project 90×2030. Why was Project 90×2030 created? 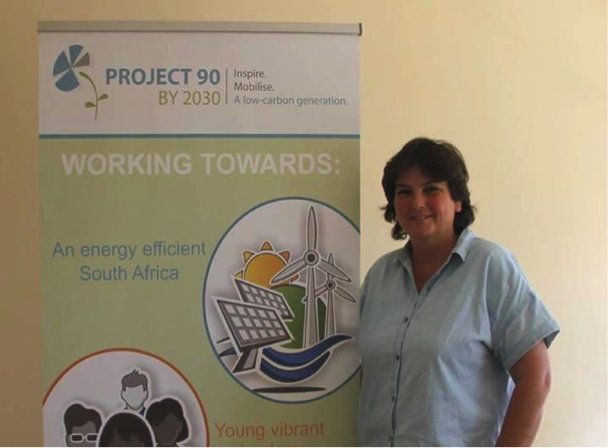 Lorna Fuller, Director of Project 90×2030: “Project 90×2030 was created out of a sense of urgency to get South-Africa to start looking at what we are doing to our earth systems. The name ‘Project 90×2030’ means that we are hoping to inspire a 90% change by the year 2030 in the way that we engage with earth systems. We need to save the planet! What inspired the founder of this non-profit organization? “The creator of this NPO was inspired in 2007 when she read a book by George Monbiot called ‘Heat’, and from that the name Project 90×2030 resulted. She was quite determined that we have to reduce our carbon offset by 90% by the year 2030 to avoid trouble. So, that was exactly where the name came from. What are the three main programs you are implementing now? “We have three areas. The first is really around policy and research, where we research energy policies in South-Africa. We would like to make the knowledge available to people and assist government to make strategic decisions. We also created a group called Electrical Governance Initiative (EGI), where NGOs are working towards the same goals. They have produced a booklet called ‘The smart electricity planning’, which has been changed into training opportunities for communities, for local government, as well as just having resources available that people can use to make strategic decisions. So, we are hoping to influence different levels of society through the policy and research work. The second area is really around community partnership programs. This is where we assist communities in addressing the energy issues. It may be providing renewable energy alternatives, and just helping them to know how to engage with government to access electricity in the future. We have just recently completed a few projects, and the last one was in East London. That program was really wrapped up nicely, it has been over two years of engagement with the community. It consists in providing each household with a ‘lightbox’ – which is a solar panel that gives light and a charger for cell phones – as well as rain tanks and training on permaculture for future food security issues. The third program is around young leaders. We have clubs at schools to encourage young people to start caring about their carbon footprint and just about the environment. When young people grow up, they form the core of our young leaders, and we are hoping to send 90 of them to Paris in 2015 to engage in the Conference of the Parties (COP) process there. What are the main results that you are proud of? “Our ‘Smart training’ has really good results: we have some of our recommendations incorporated into the Integrated Energy Plan (IEP) and the Integrated Resource Plan (IRP) in South Africa, some workshops with government which is great. For the young leaders, we have managed to send five people to Warsaw last year to the COP process there, hoping to send a few more to Lima. So, that is growing really well! We have got some wonderful members, young people that are really engaged. Then, in our community partnership program there is just the wrapping up of the program in East London with the households having access to ‘lightboxes’ and water tanks. Could you give three words which can describe the spirit of the organization? What is the biggest difficulty for you? “We want to be involved in so many areas and we have to remind ourselves that we need to focus on our three core areas for now, because we are relying on funding. How do you see your organization in the next years? “Our organization just wants to get going and to do more projects. I am trying to hold on the reins a little bit and be strategic. The challenge for the next few years is to secure funding. We would like to diversify our funding and have more funding from South-Africa and not just relying on big funders from overseas. So, the biggest challenge is funding. It is really hard to find funds? “Yes, it is challenging. The reporting and the responsibility are big as well. Many young South-Africans want to embark on an entrepreneurial adventure to help society. Do you have one piece of advice for them? “Never give up, and join an organization to volunteer. People have forgotten how to volunteer in South-Africa. Are you optimistic for the next years? “I am always optimistic and I see the optimism in the young people that I work with. They are so smart and so connected these days. People got smart phones and they can communicate well. There is a whole new young generation coming up that is so involved and so inspired by everything. So, I am very optimistic.